A great thing about living in Las Vegas is that you can go to Vegas whenever the mood strikes. By this I mean that I can slave away at my computer all day in a room that could be anywhere but happens to be in unincorporated Clark County not far from the Henderson border. And then, when I’m bleary-eyed and fresh air starved, I can drive a few miles and be cruising the Strip. I know many Las Vegans pride themselves on avoiding that section of Las Vegas Boulevard, but I adore being a tourist in my own town a few times a month. There’s always something new, and there’s always something old to discover, too, even if videos of implosions seem to tell another story. It’s still Vegas, even if it’s busy reinventing itself all the time. A great example of what you can find on the Strip these days is a wine tasting I attended at the Paris last week. 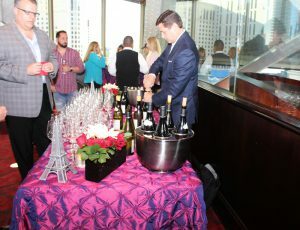 It was held in the private dining room of the Eiffel Tower Restaurant, which is at the perfect level above the Strip to provide excellent views, especially of the Bellagio fountains across the street. It was dusk when I arrived, so the views were even prettier as the sun set. All this was made more enjoyable by elegant hors d’oeuvres and a chance to taste four lovely Rhone wines provided by the M. Chapoutier winery: Chante-Alouette, 2014; Hermitage La Sizeranne, 2011; Châteauneuf-du-Pape La Bernardine Rouge, 2013; and Châteauneuf-du-Pape La Bernardine Blanc, 2014. All were great. I especially liked the Hermitage red. Joe Greber, the winery’s representative, gave a short talk about each of the wines. 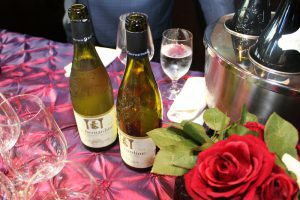 Wine tastings, I discovered while enjoying the wine and appetizers, are now a semi-regular event at the Eiffel Tower Restaurant. Held every month or so and announced on the restaurant’s website, the tastings cost $40 a person. 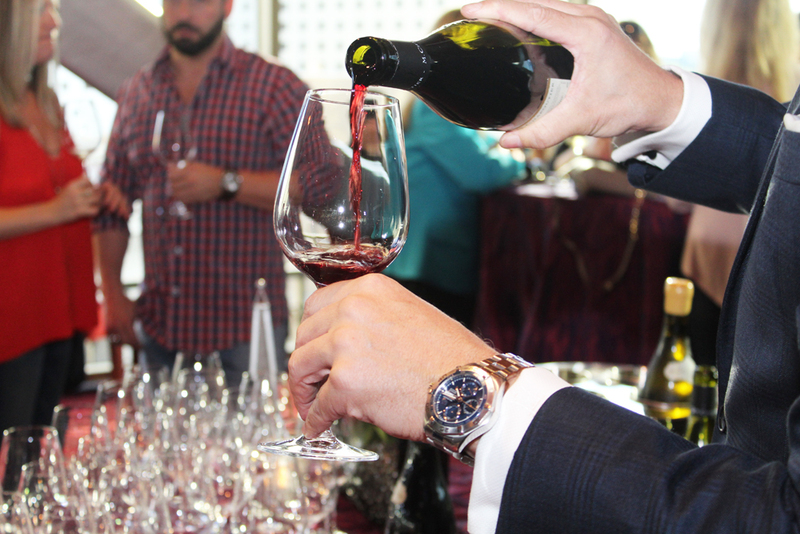 It’s a fabulous way to enjoy sunset on the Strip and learn about some great French wines. You can also stay informed by signing up for the restaurant’s email list. • Old Fashioned Style Pecan Pie, Butterscotch Ice Cream or Pumpkin Soufflé. The cost of the menu is $89 per person (not including beverage, tax and service fee). Wine pairings are $49 per person. For more information and reservations, call 702-948-6937. One of the wines served at this event was the very rare M. Chapoutier Chateauneuf du Pape Blanc 2014, it is hard to find in stores or online making this a truly special addition to the wine tasting event. A very nice selection of appetizers were served by waiters and the pours tended to be on the side of “local pours” in size. It is also an incredible event to people watch — there were some very interesting clothing choices on the part of the guests. Really was a fun way to spend a couple of hours! (edit: Joe Greber provided a correction in the name of the wine above. It is now correct).